As we take our seats in the upstairs theatre of the Oval House we are confronted with a stage laid out with a spiral of large orange dots looking like a relative of the game Twister. In the centre sits an Orville the Duck on a turntable and off to the side is a 1970s portable television displaying the wordsCrimplene Millionaire. The cheesy 70s game show music starts up and our grey haired, bushy eyebrowed and mutli-patterned crimplene clad host takes to the stage with the swagger of an old-time light entertainer who has spent his life on the boards. Please welcome Derek Daniels! 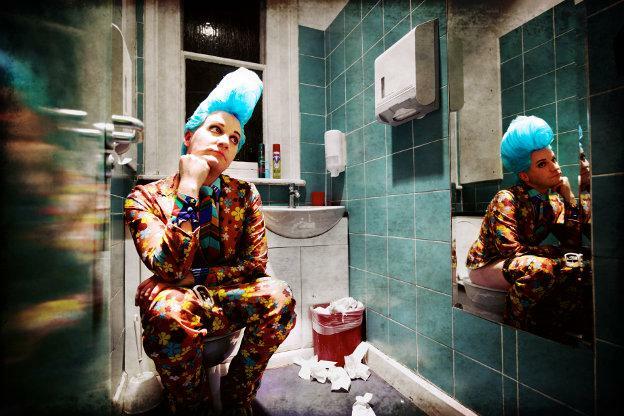 Derek is the new creation of Stuart Alexander, aka Boogaloo Stu – a DJ, singer, performer, party host and performance artist who’s a legend in Brighton and a regular with Duckie. Although Boogaloo Stu is a theatrical creation, he has been partying, singing and making glove puppets amongst us for a good many years, so it’s good to see his work moving into a more theatrical setting with a character that you wouldn’t want to make friends with. The show begins with Derek splitting the audience into three teams, each choosing a 70s icon to place on the stage/game-board which he moves around Ludo style as we throw giant fluffy dice. Each orange dot has a theme relating to the 70s , and will reveal a TV clip, a song or a challenge. While the game is played Derek regales us with showbiz stories of his life and career. He is a very strange character with an undefined northern accent that can switch between Brummie and Geordie in the middle of a sentence, and that rises higher and higher in pitch until it’s so high Derek has to sometimes stop and start again at a lower register (a reason for this is revealed later on in the show). The hammy bad acting, shtick, cringing patter and dodgy innuendos all reminding us of the darker side of seventies light entertainment (this show forms the ’70s’ element of Ovallhouse’s current Counterculture 50 journey through the decades). Behind the ‘game for a laugh’ and supposed innocence of family entertainment is the story told by the themes on the board – one of a very dark decade of strikes, blackouts, riots, and of confronting the status quo of the post-war, ‘never had it so good’ generation. If the 60s was about revolution (failed), the 70s was a time of rebellion: class, race and sexual politics, all against the backdrop of jolly, upbeat TV commercials, catchphrases and Saturday night variety entertainment. The establishment, media and press struggled to keep up, while the mood on the streets darkened. This show could be seen as an ironic look back at how foolish we were or equally a celebration of our slowly evolving liberation with a warning not to be too complacent. The recent Jimmy Saville disclosures, pointing to the apparent involvement of some of the 70s biggest stars, hangs over the performance and is hinted at during Derek’s monologues. All of this is handled by Stu with grace, charm and a lightness of touch. The game show format, the questioning of the audience and the constant stream of information constantly remind us that just 30 years ago people were fighting for rights we now take for granted. It was great to see Stu step out of his usual loveable bewigged and cat-suited persona to show a more complex and disquieting side to the retro themes he explores. The show was directed by Emma Kilbey who has obviously helped bring a theatrical discipline and structure to the show even if it does get a bit messy at times (butterscotch Angel Delight anyone?). Highlights were the great songs, the perfectly judged soundtrack, and what must have been the result of weeks rummaging in the second-hand shops of Brighton – the crimplene. The show has its faults – there were many technical issues and some confusion managing the audience interaction on the night, and Derek’s accent could do with settling in one county – but my feeling was we were in at the start of something special, and that the show will only get better. Derek is a great character, all the better for the suspicion that he is secretly more monster than loveable rogue. I’m looking forward to seeing his court case.